If you're looking for an insert for a tight space or small room in your house, the 10,000 BTU Empire VFP20IN33L10N Innsbrook Vent-Free Fireplace Insert is a great option for you. With the insert surround (sold separately), this fireplace insert provides a realistic looking fireplace that puts off enough heat to create a cozy atmosphere by the fire. 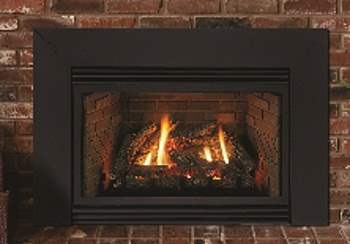 This insert also has a 99% efficiency, can operate in a power outage, has a variable speed blower, and has a built in thermostat, making it an ideal option for supplementing your existing heating system with a backup heating option with a natural gas powered fireplace. This says "Vent Free" - does that mean that this unit does not need a chimney? That is exactly what it means! This unit requires no venting as it draws and exhausts into the room. With its incredibly high combustion efficiency, you are only getting water vapor back into the room. A drawback is that the unit will shutdown if the oxygen is low in the room, so you cannot run it all day or night.